Pitcher Dylan Dennings has his future all mapped out: make the minors straight out of high school, work his way up the farm system, and get called up to the majors by the time he's twenty-three. The Plan has been his sole focus for years, and if making his dreams come true means instituting a strict " no girls" policy, so be it. Lucy Foster, needlepoint ninja, big sister to an aspiring pitcher, and chicken advocate, likes a little mayhem. So what if she gets lost taking her brother to baseball camp...at her own high school? The pitching coach, some hotshot high school player, obviously thinks she's a hot mess. Too bad he's cute, because he's so not her type. The Perfectly Imperfect Match is the third installment of Suttonville Sentinels, and can easily be read as a standalone. While the hero and heroine from book two do make an appearance on the pages, their previous story doesn't make an impact on the current one. Although, I was happy to see them, reconnect with them. If you're not reading this as a standalone, you no doubt will remember Dylan. Uptight. Obsessed with his future plans, to the point he isn't living in the now. He's hitched all of his dreams, hopes, and aspirations with singular focus, to the point it's unhealthy and could be a detriment should things not go according to plan. Fate and destiny and things happen, just because you plan it or want it, doesn't make it so. This is a lesson Dylan needs to learn, and in a way that doesn't leave lasting damage. Lucy is an interesting character. Free-spirit, chicken savior, and colorful rebel. She's the daughter of a serviceman who is deployed and a quilt shop owner. To help her family, Lucy stitches/embroiders various items to bring in side money and bring new clientele into the shop, all the while helping raise her nine-year-old brother. Otis enrolls in summer camp – the budding pitcher is placed under the tutelage of Dylan, and that's how Dylan and Lucy meet. Without giving a book report, the pair have some angsty bumps and bruises along the way. There's heat and intensity, bucket loads of chemistry. Dylan has a 'no girls' policy, and fears Lucy is throwing him off his game. Lucy is worried about Otis' relationship with his pitching coach, so she doesn't want to come between her baby brother and his idol. The Perfectly Imperfect Match was a delightfully sweet read, full of crushing and budding love, and it put a smile on my face. Until the epilogue – boom – emotional extortion by the author. Mad props to Highley for making me cry (happy tears, of course). Definitely recommend to lovers of the Young Adult genre, no matter if they are actual young adults or the young at heart. I look forward to more in this series and more by this author. *I will say, from my own experience, grown men and boys alike do believe the 'no girls' nonsense. My grandfather, who was old enough to be my great-grandfather, was always bringing up failure in the baseball world due to his son getting a girlfriend – (I can't remember what team he played for) unable to be apart from her, he made her his wife and had children. Blaming my aunt, of course. Is it true? I have no idea – it was a generation or three before my time, but adult me knows the misogynistic blame-game is a great way to explain away what really happened. But boys and men do believe that nonsense, so I could relate to both Dylan and Lucy as I read the book and it brought up the memory of my grandfather, enough so I could even hear his voice. Swoon – still waiting on those unicorns. Young Adult age-range: 12+. Kissing and adult language. 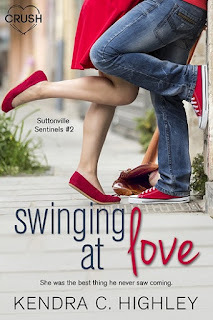 The Perfectly Imperfect Match is book #3 in Kendra C. Highley's Suttonville Sentinels series and just as addictive as her first, Swinging at Love. You can easily read these as a standalone, but Swinging at Love, book #2, is totally worth a read for any young adult romance fan. Highley will easily draw you in with her swoon worthy characters and keep you turning the pages all night! 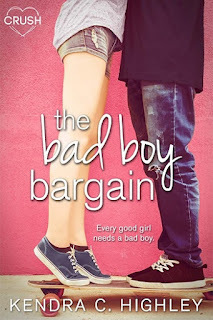 For reviews & more info, check out our The Bad Boy Bargain post. For reviews & more info, check out our Swinging at Love post. Reviewers on the Wicked Reads Review Team were provided a free copy of The Perfectly Imperfect Match (Suttonville Sentinels #3) by Kendra C. Highley to read and review.